Additional acreage can be assembled. Excellent site for truck stop, retail center, mini storage or other highway oriented businesses. Excellent development land along northbound exit ramp, Exit 86, I-395. Great highway visibility. Relatively flat-previously mined for sand & gravel. 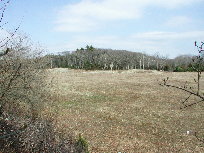 Possible assemblage of additional 14 or more acres. Entry via Rt. 201, Hopeville Rd. 21 relatively flat acres at south-east quadrant of Exit 86, I-395.